Nothing is as comforting as a spicy bread or cake in Winter and this recipe is moist and delicious. it would make excellent french toast for breakfast. Sift the flour, cinnamon, baking soda, baking powder, and salt together. In a separate bowl, mix the sugar, vegetable oil, eggs, and vanilla. 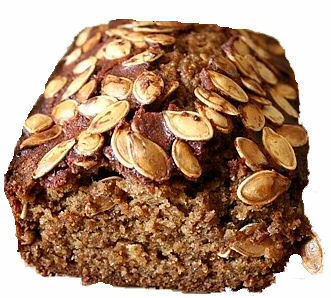 Combine both mixtures and fold in the shredded pumpkin and pumpkin seeds. Once the ingredients are all incorporated pour into a non- stick 9 by 5 by 3-inch loaf pan. If your pan is not non- stick coat it with butter and flour.